Technically there are four seasons on the farm – spring is always the first when I think of the chronological order of the season. Everything is green, plans are new - spring always gives the most hope for the upcoming farming season. Spring gives way to summer with the heat. The sun beats the green grass on the hill into a golden dry yellow, and everything on the farm begins to scream for water. As the heat subsides, the thought of rain as a possibility arrives with the fall. Fall is the season I long for every year. It is when we begin to know how things are going to end up, and more importantly, it signifies that we are on the home stretch to the slow time. The winter warming fire in the living room is literally the light at end of the tunnel for a full year of farming. In reality, the four seasons of the farm fall into two types of life – life with and life without tomatoes. Life with tomatoes has started. It is too cold outside, but we clever humans have developed an artificially warm greenhouse where the humid smell that feels like humus surrounds trays of millions of little tomato seeds that have germinated into tiny tomato plants. At this point, they are not even recognizable as tomato plants, but their smell gives them away. 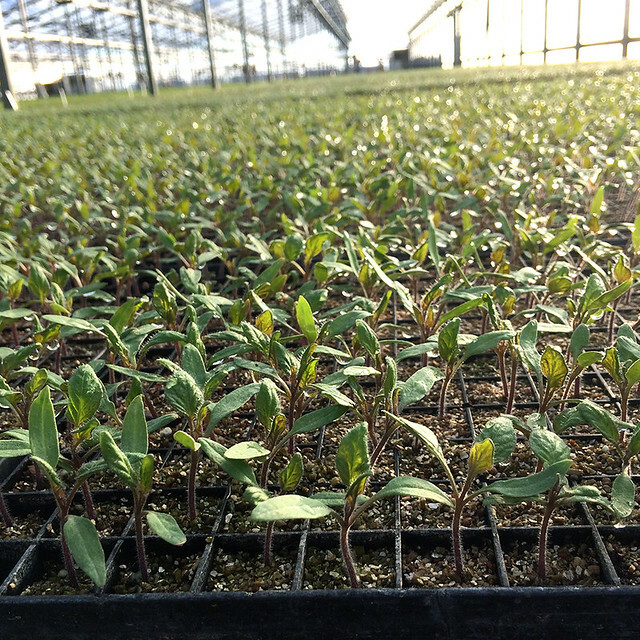 Even tiny little tomato plants have the grown up tomato smell on their leaves. Outside the greenhouse, we wait and hope for some more water. The cover crops are growing well. The hearty winter vegetables are doing fine with the light frosts of the morning, and they find time to grow in the sunny, California winter days. The tomato fields lie empty, already bedded up, waiting for things to dry out just enough to begin the final preparation for the tomato plants that are still smaller than a pea sprout in the greenhouse. Hopefully next week, we will inject the drip tape into the fields and get the sub main lines in place to connect the tomato plants life line of water to the pumps that will feed their thirst during the inevitable summer heat. Enjoy your boxes this week and know we are busting to get your summer bounty in the ground on schedule.